Banking is undergoing a technological churn right now due to rising competition from fin-tech startups and increasing concern for cyber-security. Today, we are going to look at 10 technologies that are going to impact the future of banking sector! FSI sector in general, and Banking in particular, are undergoing a technological churn right now. The reason is two-fold: changing customer expectations and improved technological capabilities. The rising competition from Fin-tech start-ups that use technology to create unique customer experiences around banking & other financial services has forced the large banks to respond by innovating themselves. Further, the threat of cyber-security breaches has meant that banks need to be more agile than ever before. Today, we are going to look at 10 innovative technologies in banking that are shaping the future. But, before we go through each technology, let's take a look on why banking sector is ripe for disruption. For long, banks have been reluctant to update their systems – and for good reason. The current systems that they use are the product of years of continued innovation to meet immediate customer requirements. But this has resulted in siloed systems being used for the transaction, savings, investment and loan accounts. This is not suited for the digital age when the competition for banks is coming from technology-based FinTech startups. Banks and other traditional financial service provider have had to respond with an array of digitization and innovation initiatives. These initiatives employ cutting-edge technologies to ensure a customer-centric perspective rather than the traditional focus on products, real-time intelligent data integration rather than slow analysis being performed after-the-fact and open platform foundation. 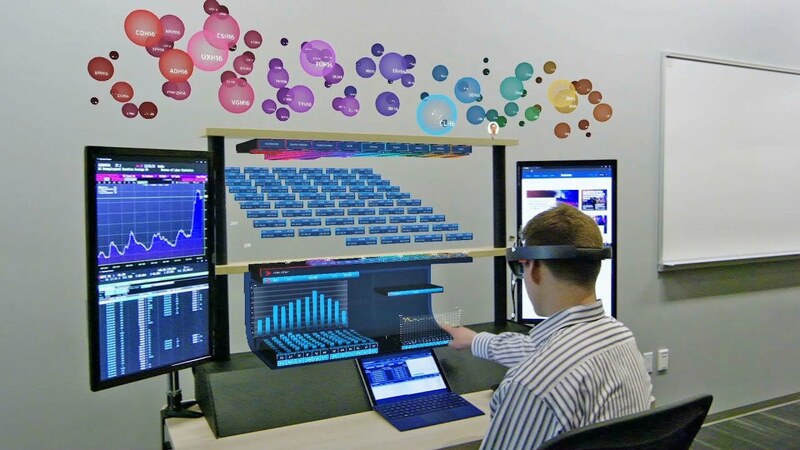 Immersive technologies such as Augmented, virtual, and mixed reality are enhancing customer experience across the board. So why can’t they do the same for banking customers? The possibilities of the implementation of augmented reality technology in banking sector are only limited by imagination, though these are still in a very early stage of development. The end-state is to give customers complete autonomy in actions and transactions they could perform at home. Hybrid branches are envisioned by technology experts who believe that bank branches as we know them today are a thing of past. One of the implementations of augmented reality technology in banking sector, that is already live, has been made by the Commonwealth Bank of Australia. They have created a rich date augmented reality application for their customers who were looking to buy or sell a home. It provides them with information like current listings, recent sales, and price tendencies to help the customer make better decisions. Blockchain is a catchall phrase used to describe distributed ledger technologies. You could think of it as a distributed database with no DBA involved. It allows multiple parties to access the same data simultaneously, and at the same time ensures the integrity and immutability of the records entered in the database. At present, leading banks around the world are exploring proof of concept projects across various aspects of banking and financial services. The first major implementation that we are likely to see is in the areas for clearing and settlement. Accenture estimates that investment banks would be able to save $10 billion by deploying blockchain technology to improve the efficiency of clearing and settlement systems. Another major area in which banks will see a huge saving by using blockchain technology is KYC (Know Your Customer) operations. Business models being developed at the moment would turn KYC from a cost centre into a profit centre for banks – as they would come to rely on a shared blockchain for this activity. Syndicated loans, trade finance and payments are other areas where the smart contracts on blockchain could be highly effective. The volume of unstructured data that the bank has to process is increasing exponentially with the rise of the digital economy. This is not just banking transaction data, but also other behavioral data that could potentially allow the banks to improve and innovate customer experience. This has made bankers realize that they need to find technologies that can mimic human action and judgment but at a higher speed, scale, and quality. The answer that has emerged is a combination of various technologies that enable cognitive and robotic process automation in banking. These technologies consist of machine learning, natural language processing, chatbots, robotic process automation, and intelligent analytics in banking that allow the bots to learn and improve. It is no surprise that Deloitte’s 2017 State of Cognitive survey found that 88% of financial service professionals believe that such technologies are a strategic priority. That said, the current state of the art in robotic automation is still quite weak at the cognitive and analytical aspects of the processes. In the years to come, we would see the current cognitive capabilities being bundled with the robotic process automation to achieve even better results. This is already being implemented in point-of-sale solutions that automatically suggest marketing promotions that would be most effective for an individual customer. Quantum computing is a way of using quantum mechanics to work out complex data operations. As is common knowledge today, computers use bits that can have two values – 1 or 0. Quantum computing uses “quantum bits” that can instead have three states – 1 or 0 or both. This unlocks exponential computing power over traditional computing – when the right algorithm is used. This represents a huge leap in computing power, but any commercial implementations are still decades away. Nevertheless, firms like JPMorgan Chase and Barclays are investing in quantum computing research in partnership with IBM. The explosive growth that the last decade has seen in the amount of structured and unstructured data available with the banks, combined with the growth of cloud computing and machine learning technologies has created a perfect storm for Artificial Intelligence to be used across the spectrum of banking and financial services landscape. Business needs and capabilities of AI implementations have grown hand-in-hand and banks are looking at Artificial Intelligence as a differentiator to beat down the emerging competition. Artificial Intelligence allows banks to use the large histories of data that they capture to make much better decisions across various functions including back-office operations, customer experience, marketing, product delivery risk management, and compliance. WEF report “the New Physics of Financial Services” has identified the following sector-specific opportunities that will be opened thanks to AI deployment in banking and financial services. These opportunities are spread across deposits, lending, payments, investment management, capital markets, and market infrastructure. Artificial intelligence would revolutionize banks by shifting the focus from the scale of assets to scale of data. The banks would now aim to deliver tailored experiences to their customers rather than build mass products for large markets. Instead of retaining customers through high switching costs, banks would now be able to become more customer-focused and retain them by providing high retention benefits. Most importantly, banks would no more just depend on human ingenuity for improving their services. Instead, performance would be a product of the interplay between technology and talent. The time when banks could control the whole customer experience through a monolithic system that controlled everything from keeping records to every customer interaction is long gone. Both the regulatory requirements and the revolving customer needs have turned this humongous system into dinosaurs. Today banks need to instead build “banking stacks” that allow them to be a platform to which customers and third-party service providers can connect to deliver a flexible and personalized experience to the end user. To do so, they can use API platforms for banking. API Banking Platform is designed to work through APIs that sit between the banks' backend execution and front-end experiences provided by either the bank itself or third party partners. This allows the banks to adopt completely new business models and use cases (for example, enabling salary advances) and experiment with new technologies like blockchain at low cost. APIs also help banks to future-proof their systems as the front-end is no more tightly coupled with the backend. The nature of cyber risk changes at a great speed. This makes the traditional approaches to risk management obsolete. It is now clear that it is impossible for organizations to eliminate all possible sources of cyber threats and limiting the attack footprint at the earliest is the best way to deal with these. The banks will have to be nimble in the way they approach cybersecurity. Increasingly banks are deploying advanced analytic, real-time monitoring and AI to detect threats and stop them from disrupting the systems. The use of big data analysis techniques to get an earlier visibility of threats and acting to stop them before they happen is called prescriptive security. While the disruption brought by implementing the new technique may lead to an increase in vulnerability at the start, this is the way forward to stop the ever increasing data breaches that various organizations are reporting. One of the biggest challenges that the digital age has brought to banking is the need to respond quickly. The constantly evolving market that banks operate in requires them to be as agile as possible. They need to be able to provide resources across the enterprise in a timely manner to address business problems faster. High performing banks have discovered that the most cost-effective way of achieving this is through an enterprise-wide hybrid cloud. This allows them to pick benefits of both public and private while addressing issues like data security, governance, and compliance along with the ability to mobilize large resources in a matter of minutes. Hybrid cloud also allows banks to offer innovative new offerings to its customers. For example, ICICI Bank has partnered with Zoho to allow businesses to automate the basic reconciliation process through Zoho Books, a cloud accounting software. The partnership does away with the need for data entry and also makes it easier to offer multiple payment options to the customers. As the world moves towards a less-cash economy, the customer expectations around payments have changed dramatically. Both customers and business expect payments to happen instantaneously, and this is where instant payment systems step in. Instantaneous payment is a must if online payments need to replace cash transactions. Therefore, banks around the world are finding ways of providing their customers options for instant payment, even when the infrastructure required for the service is lacking. For example, banks in Kenya are partnering together to provide P2P payment experience to their customer base. You would soon see banks combining their instant payment capabilities with third-party e- and m-commerce solutions to develop a new portfolio of services. You must have already seen assistants like Amazon’s Alexa and Google Home in action. Can you imagine the impact these could have on banking applications? In fact, Bank of America has already developed Erica as a virtual assistant specifically for banking operations. These smart machines are beginning to act as digital concierges for the customer in interacting with banks as well. Banks will have to invest in digital engagement to ensure long lasting relationships with the customer. Remember that customers will gravitate towards banks that are easiest to work with when they are using technologies that they have become habituated to. As the banks recognize this skill gap that stops them from transforming to meet the potential presented by technology – they are beginning to invest significant amounts into banking technologies they seem most relevant for their business models. For example, blockchain might not be a priority for most industries today, but banks and financial institutes foresee a great advantage in implementing these. Therefore, the financial services industry as a whole sees them as a high priority investment. Further, the evolution of the banking industry makes it imperative that technology becomes a “core competency” with enterprise-wide engagement. The technology focus cannot be limited to the top alone, or even to an IT department cutoff from the rest of the operations. Finally, the focus of technology implementation must be customer experience – and not revenue or cost savings. Those are important but will come automatically if you can retain customers in the years to come. In the years to come, bankers will have look at FinTech startups as partners rather than competitors. Remember that a bank can be the biggest customer for a FinTech company and can help them reach a newer customer base. This is where developing a banking platform will come in handy and result in better customer satisfaction. Bankers should work towards new business models where they own the customer relationships and pull together FinTech resources from around the globe to generate the most value for the end customer. While banking has come a long way since the advent of coins and financial systems , there are still critical problems with banks today. This blog features common banking challenges that are going to be a major concern for banks in 2019. If you are wondering if Augmented reality has any applications in the banking sector, check out these 11 banks that have already successfully adopted AR to usher into a new technological era!